“I have been noticing an on again/off again problem with the sounding at Guaymas recently and it is occasionally too wet. Today, the error was the largest yet and somehow these bad data made it into the GFS. As you can see from the attachment (see above), the GPS/IPW corrections were huge at Hermosillo and over the far SW part of Arizona. The GFS initialized Guaymas with 56mm whereas the GPS/IPW was 42mm. Yuma was 9mm too wet and Organ Pipe was 6.7mm too wet. The corrections were not applied to the WRF-GFS run from this morning, as the GPS/IPW data were delayed, causing serious havoc within the forecast. I also looked at the NAM and its IPW field was fine over NW Mexico. Mike has sleuthed this out and I am embarrassed that I got sucked-in and highlighted a bad sounding (in hindsight a PW value of almost 3 inches should have set off all kinds of mental alarms). How ironic! After two very humid and hazy mornings in Tucson, the sky was cleaner and relative humidity noticeably lower this morning. A quick look at 24-hour changes this morning indicates that, for the southern Arizona stations, dewpoints have decreased 5 to 12F and pressures have risen ½ to almost 3 mb – neither of these trends is very exciting. However, conditions are more moist at El Paso where the dewpoint change was +9F and the pressure was up 5 mb this morning. The El Paso sounding is considerably more moist than is the very dry Tucson sounding. To our south, the Guaymas sounding (see above), assuming it can be believed, is remarkably moist with almost 3 inches of precipitable water. So, the question remains: how long will the dry out persist before the subtropical air over Mexico is pulled north across the border? The 500 mb anticyclone again has three circulation centers – one over central California, one over northwestern Mexico southwest of Tucson, and one southeast of Brownsville, Texas. There are several weak troughs separating the centers and the most pronounced, according to the NAM, lies over northern Mexico to the south-central Gulf of California. This morning’s NAM forecast consolidates the S/W over Mexico and moves it slowly westward across the central Gulf of California. So, the convection associated with this feature may push the subtropical moisture back northward. The NAM also gradually consolidates the 500 mb anticyclone over the New Mexico/Arizona border. The NAM keeps the dry out going through this forecast cycle, but moisture will undoubtedly return sooner that the model forecasts. So, all eyes to the south for the next day or two. Morning dewpoints across southern Arizona are again quite high, however precipitable water amounts are down below an inch everywhere except far southeast corner of state. Only slight changes from yesterday when thunderstorms occurred only in far southeast. For the fourth straight day there was no precipitation recorded at any of the gauges in eastern Pima County. Anticyclone remains to the south but may be inching closer since winds at Tucson are quite light below 500 mb. This change in the shear may help mountain towers break through the very hostile dry air that is present above 700 mb. Sounding indicates little or no CAPE will be present at lower elevations by afternoon. Weakening 500 mb S/W moves across northern Arizona today, with little impact down south except perhaps for some warming of the middle-level temperatures. Surge of very moist low-level air continues up the GoC and this may become important once the anticyclone moves back into the southwest US. But for today the dry out continues. A push of high dewpoint surface air (see 1340Z surface chart above) has occurred over southern Arizona during the late night and early morning hours. The push has brought very high dewpoints to the lower Colorado River Basin with Yuma reaching Td of 75F. The push has gradually worked its way north during the morning. Doppler radar VADs indicate that the surge at Yuma reaches to 3,000 ft AGL with south-southeast winds of about 20 kts in this layer. At Tucson and Phoenix the layer of southerly flow extends only to about 2,000 ft AGL. With strong westerly winds above, the moisture should mix out fairly quickly this late morning. The upper-air charts are reminiscent of late May or early June this morning and the two features of most interest are a small vorticity maximum hanging over the central GoC in the NAM progs, and a weak S/W in the westerlies approaching northern Arizona from central California. There is cooler middle-level air with this S/W, but it will tend to avoid southern Arizona where the fetch is still around the huge anticyclone over Mexico. However, the combination of very hot temperatures, some increase in moisture, and the approaching S/W will probably lead to a bit more storm activity over mostly higher elevations across the north and east portions of Arizona today. I thought that the difference between the RRS too-dry sounding at 00Z yesterday and the GPS PW was as bad as I'd seen. But this afternoon's sounding at TWC was even worse - 0.37" for RRS versus 1 inch or so for GPS. The GPS values are very consistent around the southern part of state, so the RRS data from TWC are probably seriously in error - again, I think this is the worst I've seen. 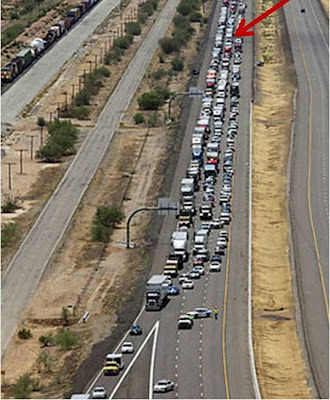 There was a serious accident on I-10 last Friday morning that closed down the interstate in both directions. Here we are in the midst of the mess. We eventually got to Phoenix after an eastward diversion through Florence. Never thought we'd be passing by the Tom Mix Memorial when we headed out that morning! Obviously the westerlies have had a negative impact on the monsoon and only question is when will the moisture return. The models this morning show an upper level low dropping off the west coast…quite unusual for this time of year. Synoptic systems tend to pull mid level moisture back quicker…possibly late Friday we can have enough moisture for high based storms. Low level moisture…a Saturday/Sunday morning surge is possible. Hot ‘til then. Big Dry Out - How long Will It Continue? Big Dry Out – How Long Will It Continue? Today is the third day of the big dry out. No precipitation in the ALERT network on Sunday and Monday. The big question is whether or not there will be anymore precipitation in the local area before the end of July. The NAM indicates NOT. Last night there were two large MCSs in Mexico – one peaked in northern Mexico, south of the New Mexico boot heel around 0800Z and the other is still active (see image for 1330Z above) over the southern Gulf of California. Some outflow from the northern MCS has pushed into far southeast Arizona, as indicated by the surface observations at Douglas and Rucker RAWS. Precipitable water is down to less than an inch in southwest Arizona and ranges around an inch to an inch and a quarter over the rest of southern Arizona. In contrast, the Guaymas sounding indicates 2.1 inches this morning, so there is a very large gradient across northern Mexico. Although the 500 mb anticyclone remains in an unfavorable location for storms, there are several things of interest in the data this morning. Surface pressures have been falling considerably over the lower Colorado River Basin – 24 hour falls of 2 to 3.5 mb from Tucson to Kingman and southwest of that line. There is a large pressure gradient up the Gulf of California and the trend should be for the higher moisture to try to come back to the north. A loop of the satellite water vapor imagery seems to indicate that this is happening. The TWC morning sounding remains too dry, but only by about 0.3” this morning. The bad data in the lower part of the RRS soundings makes forecasting convection difficult (as per comments on last evening’s post). But, the Phoenix and Tucson soundings appear to indicate that storms are possible over higher elevations of eastern Arizona and along the borderlands this afternoon and evening. Will be keeping a close eye on the very unstable, subtropical air mass over northern and northwestern Mexico. I had a request that I be sure to post the extremely bad sounding from TWC last evening, so that readers could see the sounding that went with the GPS/RAOB comparison plot in the previous post (below). The way-too-dry sounding is shown above. Have returned home a bit ago and have been getting caught up on the weather - mostly hot while we were away, and found the rain gauge dry and dusty. I looked at the TWC from 00Z 28 July and found that the RRS sonde performed about as bad as I've seen this evening. The sounding data indicate that precipitable water is 0.6", however, as the plot above shows, the GPS data indicate that precipitable water is actually about 1.2"! Thus, the RRS data are too dry by a factor of 2. Would imagine that this large error could have substantial negative feedbacks into models and the forecasting process. Yesterday ended up suppressed in the immediate metro Tucson area, but with storms in all directions on the higher terrain. The storm in the Computer Science web cam view above was raining lightly but producing quite a bit of lightning. Heard thunder rumbles at house from this storm. The Pima County ALERT gauge network had measurable rain at 44 of the 93 gauges; mostly those at higher elevations and those to south and west of Tucson. The morning showers yesterday, plus the abundant cloud cover, cooled the lowest elevations and keep temps down, shutting down the lower elevations of town. The morning sounding at TWC today has the most precipitable water of the summer and most of the GPS sites in southern Arizona have 1.75 to 2.00” of water vapor. Excellent sounding for heavy rains and wet downbursts – assuming there is better heating today. The 500mb anticyclone center is far off in northwestern Colorado and the high has a very distinct, elongated south to north shape. This has allowed a significant south-southeast fetch from low latitudes that has moistened most of the west portion of the anticyclone. The NAM indicates that this will continue through about 24 to 36 hours. The NAM also forecasts the most significant storm activity today to occur out in the western portions of the state and the Rim/White Mountain country. We’re leaving in an hour or so for four days in the Rim Country, and I won’t get another look at the charts, or be blogging, until next week. I am soaking some of the plants, for insurance, before we leave. There was a definite up-tick in activity over southeastern Arizona yesterday. For example, 41 of the 93 Pima County ALERT stations recorded measurable precipitation. Highest amounts exceeded an inch at two locations in the Catalinas. However, rains weren’t heavy enough to produce flow in the Rillito Wash, which was dry this morning. A storm drifted south from the west flanks of the Catalinas last evening and produced lightning and thunder here at house along with a moderate to heavy shower with 0.44” of precipitation. At sunrise this morning there were showers to south and west (one of these was over the airport producing nearly a quarter inch of rain and apparently impacting the morning TWC sounding at the University), and the skies were heavily overcast. 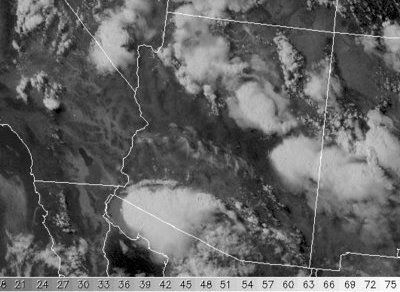 Indeed, heavy cloud cover affects the entire southwestern 2/3rds of Arizona this morning – one of many factors complicating the forecast. A very large MCS affected western Mexico and the central GoC for much of the past 12 hours – see the IR image from 0330Z on the blog. This event will keep moist, subtropical air flowing up the Gulf into southwestern Arizona and southeastern California. The MCS and intense activity over Mexico has apparently interacted with several weak inverted troughs, with the result that there appears to a strengthened and significant inverted trough present at 500 mb this morning – this feature stretches from just west of El Paso into the south-central GoC where there is undoubtedly a fairly strong, convectively enhanced vorticity center. The north end of this inverted trough will move westward this afternoon affecting southern Arizona. Additionally, although the main 500 mb anticyclone has shifted inland to the Nevada/Utah border, the weak trough of the last several days over southern Arizona has managed to persist and extends from between Phoenix and Tucson westward to north of San Diego. This feature has been keeping the winds aloft light and variable; whereas, 500 mb winds at Phoenix and Flagstaff are now from the east-southeast at about 20 kt. How exactly will the wind fields aloft change today along the borderlands? The NAM keeps the speeds light as the inverted trough passes by. The NAM also moves the upper-tropospheric anticyclone right overhead by midnight so that upper-level winds decrease during the day. 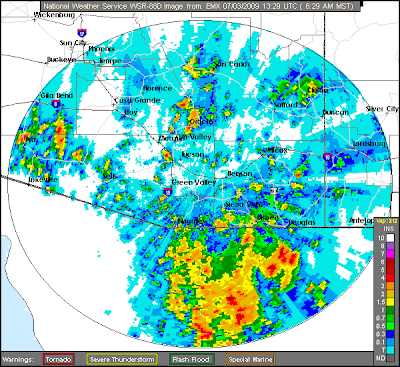 Showers and convection continue to bubble this morning, particularly from the south to west of Tucson. So, convection may be quite early today suppressing afternoon heating and keeping CAPE from building to higher levels. The morning sounding was modified by the cloud and shower activity, so it is not representative of the larger environment. IF, the boundary layer mixed at 12 g/kg, with afternoon breaks in the cloud letting enough heating to occur so that cloud base was at 700 mb, there would be a moderate amount of CAPE and a substantial threat of severe storms. But, continuing cloud and early convection would mean that the day would primarily pose a threat of locally heavy rains. Given that the inverted trough to the south will be butting heads with the middle-level high over Utah, some mix of all the above will likely occur over the south half of Arizona. Can it get anymore complicated? Dusty dirty skies at 7 am this morning thanks to the nighttime outflow from storms to the northwest - see post below. The sky at sunrise was actually quite ugly this morning - a very out-of-the ordinary situation for Arizona. The atmosphere in the Southwest is currently disorganized and chopped up and so will be this message. A very nice MCS developed southwest of Phoenix last evening (as per 05Z radar image posted on blog) – I thought that this system had some potential for continuing on toward the southeast, since it obviously had a developed a nice gust front. Alas, the active convection fell apart by 07Z and all it brought our way was a dusty outflow that lowered visibilities and produced a very dirty sky at sunrise. The 500 mb anticyclone is shifting inland as per models and is centered over the California/Nevada Sierras this morning, on it’s migration toward Utah. A weak secondary circulation center remains somewhere in northern Mexico. This leaves a long, curving, weak trough inside the anticyclone that stretches from eastern New Mexico westward between Phoenix and Tucson and then northwestward to west of Las Vegas. This feature is somewhat stagnant across Arizona. The two ends of it are forecast to move away from each other, leaving the feature even more washed out. Precipitable water has continued to increase slowly over most of Arizona due to weak advection and lots of recycling by higher elevation convection into lower elevations. Phoenix appears to be in the middle of the pooled buildup with about 1.8 inches of PW – I think the highest value I’ve seen since around the end of June. The dewpoints at 850 mb at Phoenix and Tucson are at 12C this morning and there is increased CAPE available at low elevations, and it’s just waiting for a good kick. Winds aloft over southern Arizona are essentially light and variable. The winds will be shifting to easterly directions as the high migrates toward our north, but will probably remain quite light. There is some hope that a better-defined flow field will evolve tomorrow. Finally, surface pressures are falling fairly markedly – most stations in Arizona are down 2 to almost 4 mb during the past 24 hours and lower pressures seem to be a positive for strong storms. As for the details of what the day will bring, time will tell as the various old outflows and cloud patches interact with themselves and the terrain. We've had a nice cool outflow and some sprinkles this morning. 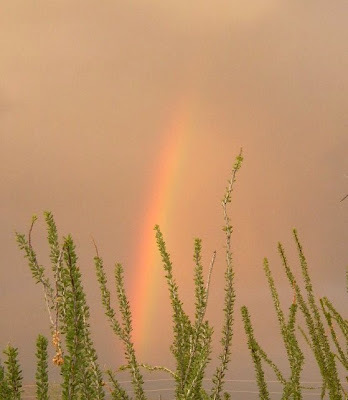 The shot of the rainbow was taken at 7:30 am MST, looking from the backyard toward the west-southwest. Morning showers and a few thunderstorms are drifting southeastward across central and southeastern Arizona. This will certainly complicate the forecast today. The up-tic I mentioned yesterday was mostly to west and north of the Tucson metro area. I see that Prescott and Phoenix both had thunderstorms with gusts to 55 mph and there was one severe report in south Phoenix as a large gust front headed south in the evening. Earlier, around 5 pm, a cell produced a downburst near Ryan Field, west of Tucson, that took down 20 power poles. But as for rain in the Pima County ALERT network, only 13 sites reported measurable rainfall. So, locally it was a down-tic in area coverage of storms. The Phoenix gust front came all the way south through the Tucson area, but the storms died out to the north and west of us. The 500 mb anticyclone continues to have two circulation centers (one along central Californina coast and one in northern Mexico somewhere southeast of Tucson) with a weak and meandering trough between the centers. The shower activity this morning is occurring in this trough zone. The NAM indicates little change through tomorrow and then shifts the California center inland and northward so that at 84 hours there is a single 500 mb anticyclone over Utah. Winds aloft remain weak and the trough over Arizona does not link with a stronger S/W coming south – so the situation over Arizona remains pretty stagnant next couple of days. There’s enough moisture for daily storms but not enough for really serious amounts of CAPE except in mountains. What more can I add, except that I’m certainly grateful that I don’t have to do a deterministic forecast for each the next seven days! Respectable convection finally made it closer to my area yesterday. NWS San Diego issued a severe thunderstorm warning late Sunday afternoon for a storm with radar-indicated 1.25" hail in the Anza-Borrego state park region. Things seem primed for a repeat performance or better today with deep moisture continuing over the area plus a nice gulf surge up the Imperial Valley. 10 am dewpoints are in the mid- to high- 70's (98/78 at El Centro, 99/75 at thermal). We drove through a lot of blowing dust on the way back from Phoenix to Tucson between 7 and 8 pm last night. At one point several cars pulled off I-10. We found puddles of water in the driveway when we arrived but the portable basketball hoop didn't get knocked over like it had Friday. On the RRS sonde problem, note also that the RRS is typically (but not always) drier than the GPS PW values which will lead to a systematic underestimate of precipitation. (Remember the good old days when the sonde and the GPS agreed to 1 to 2 mm except when there was a thunderstorm over one but not the other.) As I noted to Mike Leuthold the other day, in our paper in the NAME dedicated CLIVAR issue from April 2008 I think, when conditions are near the edge of triggering deep convection, the amount of rainfall (iat least in the virtual reality of WRF) is very dependent on the initial PWV. For the wetter of the two days we examined, the sensitivity in the southern Sonoran region was such that once the minimum amount of PWV was exceeded for deep convection, adding 1 mm of initial PWV increased the average rainfall over the region by 6 mm (!). Another interesting point, Carlos Minjarez noted yesterday is that while Sonora has been getting some impressive MCSs, Hermosillo has actually gotten very little rain so far. There were a surprising (when one examines the CAPEless TWC 00Z sounding) number of thundershowers around yesterday afternoon. Before 5 pm, 7 of the 93 ALERT gauges in eastern Pima County had recorded light amounts of rain. After 5 pm an additional 21 gauges had light rainfall from the thunderstorms that were drifting around. All amounts were less than a quarter of an inch, except for 0.55” at Florida Canyon. Here at the house there were several rumbles of thunder after 4:30 pm and the afternoon showers left 0.02” in the gauge, but another shower must have come by after dark, since there was 0.10” in the gauge this morning. Precipitable water has inched up some and there is a distinct nose of higher values out to the west in the lower Colorado River Basin – values are around 1.5” in west and around 1.25” in the Tucson area. The morning TWC sounding agrees well with the GPS PW (for first time in quite awhile) this morning and indicates that there’ll likely be more CAPE available for afternoon storms today, and the NAM indicates this also. The large 500 mb anticyclone that covers all of the southwest US has two separate circulation centers this morning – one over the central California coast and one over northern Sonora. The second center is bringing usually hostile west winds across southern Arizona, but speeds are light and there is higher moisture to the west and southwest. The NAM keeps the two circulation centers through tomorrow, with a weak trough between them. Flow in the upper-troposphere appears to be difluent over southeastern Arizona. The model forecast then brings a shortwave trough down the east side of the 500 mb ridge that affects New Mexico and Arizona – if the model forecast verifies, conditions for strong storms will be more favorable Wednesday and Thursday. Today looks much like yesterday, but probably with an up-tic in storm coverage and rain amounts. The plot at top of this post illustrates that GPS PW values have been different than TWC sounding PW amounts for most of the past five days. This uncertainty in the RRS sonde data exacerbates an already difficult, summer forecasting situation. Yesterday was essentially a down day in most of southeast Arizona with some isolated, high base storms. There were 5 of 93 stations (foothills of Catalinas and Rincons) in the ALERT network which had very light amounts of rain during the late afternoon and none with rain during the night (0.08” at one station). A cell near Casa Grande produced a report of wind damage and dust blew in over Phoenix from the south, reducing visibility at Sky Harbor to as little as a quarter mile. 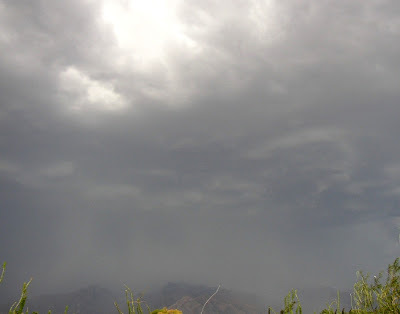 The most intense storms of the day developed over the rugged terrain of the Tohono O’odham Nation during late morning. These intensified and move rapidly westward, apparently ahead of a S/W at 500 mb. These storms (see 2245z satellite image above) reached Yuma around 4 pm producing a serious dust storm, wind damage and measured gusts to 54 mph at the airport. Yuma also reported 0.10” of rain, so mud is probably splattered over everything out there this morning. I couldn’t find a good image to grab, but there are several videos of the event up on the internet. An MCS that decayed over the central GoC may produce a shallow surge today, but it probably won’t be significant enough to change the thermodynamics much. This morning’s TWC sounding indicates that yesterday’s residual boundary layer has 6.5 g/kg mixing ratio. This value produces a lifted parcel that hits saturation at about 570 mb with theta-w of about 20.5C – really quite low for late July. Moistening during day could perhaps yield a low-elevation, lifted parcel with theta-w of 22C and a small wedge of CAPE between 500 and 300 mb. Precipitable water values are around an inch to an inch and a quarter (a bit higher after the local moistening out around Yuma). Yesterday evening’s TWC sounding exhibited the common hot/dry problem of the RRS sondes and was about 0.3” too dry. The 500 mb anticyclone is centered over the White Mountains and is progged to shift slightly southward toward Wilcox during the day. Thus, it appears that it will be another very hot day of isolated, high-based storms that will have excellent microburst/downburst potential. I will have to be watering some of the plants this evening – which again is not so typical in late July. However, the S/W that produced the Yuma storms will likely bring some excitement to the mountains and interior of southern California. We had a similarly too-dry RRS sounding at EPZ on 00z 7/16. RAOB PW was 0.79 inches... GPS was at or slightly above 1 inch. AWIPS/D2D has a rudimentary sounding modification program. "Fixing" the boundary layer dewpoints, and smoothing out the mid-level noise only gave me about 0.88 inches PW, and sfc-based cape of about 100 J/Kg.Either way, the rather stable sounding belied the reality of the convective coverage and strength, which became quite strong especially just south of the border. I forgot to mention the rainfall produced by yesterday’s storms. First, 61 of the 93 Pima County ALERT network gauges caught rainfall, so coverage was way up from previous days. Most amounts were light, half an inch or less. The maximum amount I saw was 1.02” at a station in Oro Valley. Here at house we had 0.19” and winds were not particularly strong, estimated only 20 to 30 mph. The strong north-northwest outflow that came around the east flanks of the Catalinas really flared-up the Guthrie fire and there was a spectacular, ground-hugging plume of smoke blowing off the fire. Unfortunately, I could not get a decent photo of it. The photo above shows the storms on the west flanks of the Catalinas heading into Oro Valley. There was more widespread storm activity yesterday than on Thursday and the storms occurred in the late afternoon. There were numerous reports of wind gusts over 40 mph from Luke AFB south to Sells and east to the White Mountains. Safford had lots of wind damage and bad dust in the area and measured a gust to 63 mph. The Black Hills RAWS station measured a severe gust of 57 mph and Horse Camp RAWS and Casa Grande ASOS measured gusts of 54 mph. The ATMO rooftop anemometer had a gust to 75 mph. Yesterday’s storm setup was about as synoptically evident an event as occurs out here in the Southwest. Today is more complicated. The PW trends have been down everywhere except out at Yuma, and as Mike Leuthold mentioned yesterday, the models forecast more drying this afternoon over southeast Arizona. The NAM gradually shifts the 500 mb anticyclone from western Utah toward the Four Corners by evening and then southward toward the Chirachuas tomorrow afternoon. Thus, the favorable wind shear environment for strong storms will continue through this evening but CAPE will be on the wane. The TWC morning sounding is quite interesting. First, GPS PW values indicate that the sounding is too moist by about a tenth of an inch. There are two, deep residual boundary layers present – one from about 920 to 670 mb and the second from about 630 to around 450 mb. Thus, the entire lower half of the troposphere has a very strong temperature lapse rate. There were ACC floating around at sunrise, indicating the instability present at the top of second residual layer. So, it appears to me that the situation today favors very high-based storms that move westward from the mountains producing microburst/downbursts at lower elevations where it will be very hot. Yesterday afternoon, just after 4 PM (let's say 2310Z), I was around the Tucson mall, driving east. Glancing at the Catalinas and the Rincons, it occurred to me that the atmosphere looked different from previous afternoons, like it was primed for late action (at that moment I was thinking "well, possibly 2 or 3 AM"). It's not that I was expecting a trigger, or had given much thought to the likelihood. I think what struck me was that there were a few small thin towers sitting in the haze over the foothills, out away from the mountains. So I wasn't entirely surprised to hear the first rumblings around 9 PM. Later, looking at the NWS discussion, I was trying to reconcile the reported drier sounding with what my eyes had told me at about the same time. I posted a long message below about yesterday – important event because bad RRS sounding clearly led the NWS astray on the short term forecast for the storms approaching the metro area. As for today, it appears that most ingredients for a big severe storm day are, or will be by late afternoon, in place, except for the continuing and distressing shortage of low-level moisture. I can finagle a sounding modification that gives us similar CAPE to yesterday – perhaps a tad better. The 500 mb anticyclone is over Arizona/Utah border and elongated SE to NW. Very good steering flow and shear profiles by afternoon. Cool middle level air coming around the 500 anticyclone. Not obvious exactly where weak 500 S/W might be, but NAM initialization appears a bit suspect, acerbated by missing winds at Guaymas. The weak inverted trough at 700 mb is clearly east of here and visible satellite loop indicates 500 mb S/W may be also. One possible complication is the large mass of cloud and some convection over northern Mexico and borderlands of southeast Arizona. This could limit heating to some degree and possibly get too much convection going too early. But it should be another interesting day. THUNDERSTORMS THATFIRED NEAR THE MOGOLLON RIM/WHITE MOUNTAINS HAVE PROPELLED ANOUTFLOW BOUNDARY SOUTHWESTWARD...WITH NEW STORMS FIRING ALONG ITACROSS GRAHAM AND COCHISE COUNTIES. THESE STORMS HAVE REMAINED BELOWSEVERE LIMITS...ALTHOUGH CERTAINLY HAVE SEEN PLENTY OF LIGHTNING ANDOUTFLOW WINDS OF 40-45 MPH WITH THE STRONGEST STORMS...ALONG WITHAREAS OF BLOWING DUST. DECENT COMPLEX OF STORMS IN WESTERN COCHISECOUNTY IS PUSHING OUTFLOW INTO THE TUCSON METRO AREA/EASTERN PIMACOUNTY THIS EVENING. RUC SUGGESTS THIS COMPLEX WILL STAY PRIMARILYSOUTHEAST OF TUCSON. 00Z KTWC SOUNDING SOMEWHAT DRIER WITH A PW DOWN TO NEAR ONE INCH. "You have to 'fix' it. I used nsharp to bring up the PW to near the GPS value. Then, I saw about 500J/Kg ML CAPE and about 800 surface based CAPE." The sounding last evening was too dry, as is often the case with RRS sonde data, and GPS indicated actual precipitable water about 1.3 inches – a critical flaw in the data since the missing moisture was obviously in the boundary layer, affecting CAPE and the local evolution of the spectacular lightning storms. Pat Holbrook had correctly called for an “up” day or early evening yesterday morning. The storms of interest for Tucson developed late afternoon from the flanks of Mt. Graham southward. The storms moved south and west producing two very distinct outflows that moved southwestward across all of southeast Arizona. One area of storms moved southward into Mexico as a long-lived MCS and a second area broke to the west along I-10 with the northern outflow. These storms moved into Tucson metro area around 9 pm producing frequent, vivid lightning and areas of brief TRW+. This cluster of storms dissipated rapidly after 10 pm. As the outflow moved across the metro area it apparently triggered new development along the slopes of the Catalinas, so that visually the storms seemed to be moving northward, even as radar indicated they were moving to the southwest. Quite a show! As for rainfall, 32 of the 93 ALERT gauges had measurable rainfall after 7 pm while none had any rainfall during the day. Maximum amount was 0.79” at Rancho del Lago near Vail, on the flanks of the Rincons. Here at house we had 0.38” which was most welcome; the lightning was a better show than the Fourth of July! There were strong MCSs in northern Mexico again last night with outflows moving into southern Arizona. The satellite image above shows that there were again MCSs on either side of the Sierra Madre Occidental divide – I’m not sure how unusual this might be? No stations in the Pima County ALERT network reported rain yesterday afternoon and only 12 of 93 stations had rain on Tuesday. Maybe I’m not looking hard enough, but I’m not finding much in the model progs to get excited about – is anyone else? While southeast Arizona was almost totally suppressed yesterday by the lingering impacts from the Sonoran MCSs, storms did develop over the Rim country. 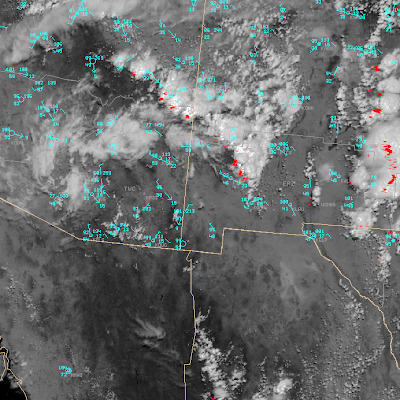 Some storms on the north side of a weak, midlevel 500 mb trough propagated into and then across the Phoenix area. 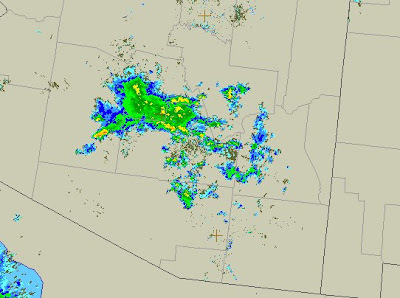 Although there were a few spots with light rain, the main impact was a duster with 3o to 40 mph outflow winds (the outflow boundary is quite clear to the west of Phoenix on the 0600Z radar image above). The weak shortwave trough remains between Phoenix and Tucson this morning and moves little during the day. 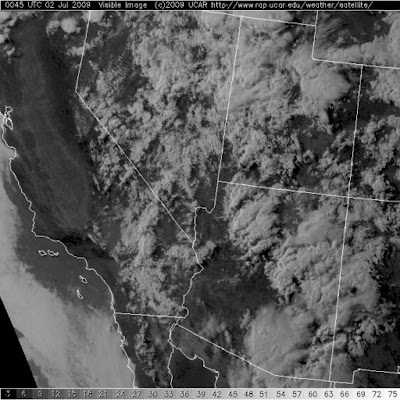 The upper-level shortwave that’s come north along the Baja Pacific coast shears out quickly to the east today. Precipitable water values remain moderate with values over Arizona of 3.1 (TUS) to 4.1 (PHX) cm. 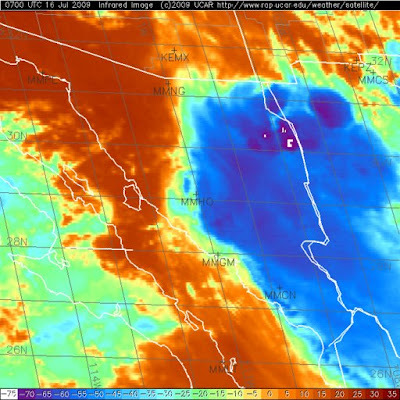 More moist and unstable subtropical air remains just south of the border (Guaymas PW this morning 4.7 cm). The Phoenix sounding indicates that there’ll be some afternoon CAPE, at least on the north side of trough. Higher elevations should continue to have highest CAPE this afternoon. With light winds below anvil level and convective cloud bases around 600 mb, storms will move slowly and produce some strong dusty outflows again. These systems actually left us with twin MCVs over southeastern Arizona. As of this afternoon (4pm MDT), convection is firing up along an arc from near Show Low, AZ to just north of Deming, NM. Surface obs suggest these are developing on the edge of the low level moist pool associated with the MCS leftovers, and aided by local terrain. I'll email you a couple screen grabs, and feel free to post them. 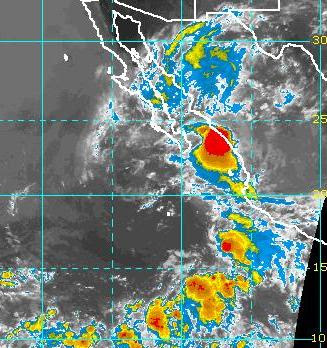 Thus, it looks like we have been smashed by huge mesohigh produced by the Sonoran MCS. 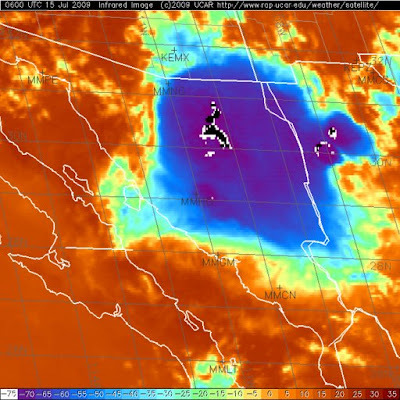 The outflowsand pressure rises caused surge up through Yuma but everywhere else is being affected by subsidence.The diverging outflow under the MCS may have pushed the subtropical air back southward over the higher terrain of Sonora while squeezing it northward up the GoC channel. Unfortunately, the surge ait has not turned westward yet, as indicated by falling dewpoints at Sells and Sasabe. So the can of worms is readjusting all over the place and it appears that any storms over SE Arizona will be late or tomorrow. But nice storms have been triggered in Rim country and west New Mexico (see graphic above). 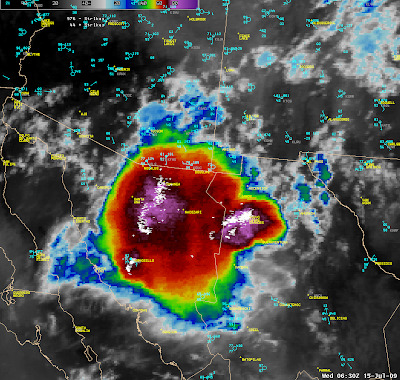 A spectacular MCS developed over Sonora during the evening (see photo above) as the upper trough moved northward. This MCS has pushed outflows and deeper moisture over most of the southern part of state, while in far west Yuma Td has gradually increased through the night. So, what a difference in things today! Depression Five-E looks more like a TS or hurricane in the morning satellite images. Upper-level trough is now about half way up Baja. Precipitable water amounts have increased about ¼ of an inch since yesterday afternoon, and are around an inch and a half over southern Arizona. 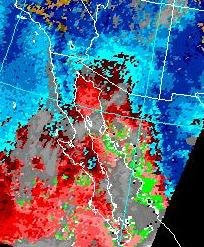 Most stations in southeast Arizona had outflows during the night form the south gusting 40 to 50 mph. It appears there may be a circulation and vorticity center left behind by the MCS – it appears to be south of Nogales and moving to the north-northwest. This feature could play an important role in this afternoon’s events. It has certainly destroyed the accuracy of the NAM initialization this morning, which is extremely bad over the Southwest! Observed 850 mb Tds are still only around 10C at Tucson, Yuma, and Phoenix this morning. But south winds of 15 to 20 kts at all three sites should help further increase low-level moisture during the day. Surface dewpoints are currently mostly in mid-to-upper 50s, except for Yuma which has increased to 70F. Mexican soundings have reappeared this morning, but probably not in time to get into the NAM initialization. The Tucson sounding’s winds are very chaotic this morning. The 500 mb wind is from the north because the MCS circulation has popped off a small anticyclone to our southwest – this should dissipate as the MCV moves by and winds at 500 mb will probably return to be southerly, but light, this afternoon. Not clear how much sunshine we’ll get to fight the low-level cooling from the MCS outflows. Thus, not obvious yet how much CAPE there may be at low elevations this afternoon and evening. But, storms will pose a threat both for heavy rain and wet microbursts. Should be an interesting day, but with all the features at play it’s a real can of worms. I did note that the Tucson NWS early morning forecast just defaulted to climo of 30% for all 14 forecast periods through next Tuesday. No further comment. Yesterday’s surge at Yuma mixed out during afternoon and precipitable water remains around an inch and a quarter across southern Arizona, with higher values remaining to the south over Mexico. More early morning convection across the southern Gulf of California (see 1400 UTC visible image above) may help sustain pushes of shallow but more moist air northward. The 500 mb anticyclone split into two lobes yesterday with the western lobe moving over New Mexico. This morning it looks like the western center is over, or even a bit south of, El Paso. (Soundings are missing for Mexico so far this morning on the SMN site also.) This has shifted the 500 mb winds to southwesterly over Arizona. The NAM consolidates the 500 high as a single center between Tucson and El Paso and then shifts it northwestward from 48 to 72 hours. No features are apparent in the model forecasts that would serve to shift the subtropical air mass back over the Southwestern US – so we’ll just have to watch it day by day. Yesterday, storms to the south pushed strong, dusty outflows across the Tucson metro area around 5 pm. Rain was reported at 7 of the 93 ALERT stations, mostly to the south toward Green Valley. I do see reports of 0.47” at Tinaja ranch and 0.63” at Picture Rocks so there were some isolated spots of respite from the brain-searing heat. This morning’s Tucson sounding has no CAPE when I modify for the afternoon, and so we’re looking at isolated storms over higher elevations and more strong and dusty outflows. Virga showers came off the Rincons last evening around 6 pm or so with some winds and blowing dust along the Rillito. Mostly hot with high of 107F – 4 ALERT stations (in the Catalina and the Rincon mountains) reported a bit of rain yesterday. Moisture has gradually increased across south-central and southwest Arizona during past 24 hours (see GOES PW at 1300 UTC above). Yuma had a nice surge between 8 and 9 pm last evening, triggered by yesterday’s MCS, and there is a lot of cloudiness in the GoC this morning and another large MCS south of the GoC mouth. This morning’s Tucson sounding shows increased PW but only a slight touch of CAPE, so more low-level moisture is needed, but the trend is good. Wind profile quite unusual with L/V winds entire upper-half of troposphere. Looks like lower-level winds will be from northwest this afternoon – hotter out that way but perhaps more moist also because of the surge. So, it looks like CAPE in the mountains and some meandering storms this afternoon. Strong downdraft environment so good chance for outflows off mountains. I'll watch the PW and Tds to see how much impact the surge has. Upper-levels appear quite diffluent next couple of days, so if moist influx continues, tomorrow could be a more interesting day. The 500 mb anticyclone has remained locked over northwest Texas, and there is very warm air over southern New Mexico. Mid-level temps have remained relatively cool over Arizona. What’s lurking over northern Mexico? As the S/W that’s onshore in the Pacific northwest moves over the ridge and digs south of Great Lakes at mid-week it will force a westward adjustment of the anticyclone. So, we might have increased activity as the large-scale goes through a period of transition. Apparently the NAM forecast on Friday morning was reasonably good, and the predicted S/W I discussed that morning led to increased storms with a decent shear profile and some westerly component to the steering flow. As we drove east from Tucson in the late afternoon there were fairly numerous Cbs in sight from east to south. As we neared the Highway 83 exit there was a solid line of storms to the east that were producing frequent cloud-to-ground lightning strikes. This line was west of Benson and the Whetstone mountains and apparently heading toward Tucson. We drove through a couple of brief, but heavy showers on 83. After several miles, a storm was about to come over the Empire mountains, and I took the photo above at 6:30 pm MST. Yes, that’s the Tucson WSR-88D on the far right side. Winds were from the east at 30 to 40 mph when I took the photo. Storms were weaker on to the south, but lightning continued, along with rumbles of thunder, until after dark (location 5 miles northwest of Sonoita). A perfect evening outing for a weatherman. 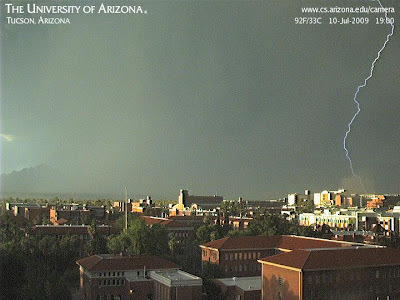 The storms rapidly moved into the Tucson area with damaging winds and frequent lightning (as per the shot from the Computer Sciences web cam). There was 0.34” in the gauge when we returned yesterday evening. There was measurable rain on Friday at 43 of the 93 Pima County ALERT gauges and these were mostly in the eastern half of the network. 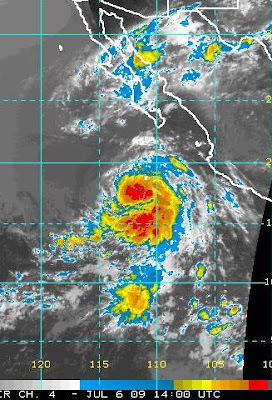 An intense MCS with multiple extremely cold cloud-top centers has been moving rapidly along the east coast of the Gulf of California toward the north-northwest. The convective event began yesterday evening, and this system has been propagating up the coast from south of Mazatlan and has now reached the central GoC. Two obvious and important questions - how long will it continue to maintain its intensity? and will it/has it intiated a strong northward surge of low-level, moist sub-tropical air? More later today. We were at dinner next to campus Friday night about 7pm. The Webcam caught the attached view as the rain shaft and frequent lightning moved across town from SE to NW. 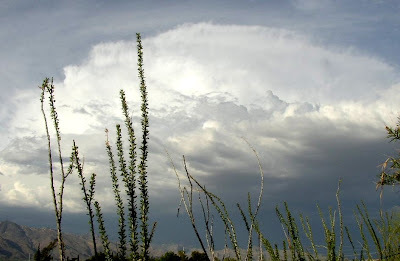 Yesterday was a day of reduced thunderstorm activity in far southeast Arizona; however, storms again developed near the Santa Rita mountains and moved northward, with some dissipating over the Tucson metro area before sunset. The partial rainbow photo (on the blog) was taken looking east-northeast from the backyard a bit before 8 pm last evening. Only 5 of the 93 ALERT gauges reported rain in past 24 hours and amounts were light. I did note that the Empire RAWS station was hit by a heavy storm for the second day in a row and it reported 1.00” in a brief period yesterday afternoon. Today is yet another problematic forecast situation. The Tucson morning sounding indicates a small amount of CAPE for late day, high-based storms. The lapse rate is nearly adiabatic to 500 mb, so that any increase in low-level moisture from the south/southeast would quickly increase CAPE. The 500 mb anticyclone is positioned aloft near Wichita Falls, Texas, and winds are southerly at all levels above 600 mb here over Tucson. It appears that the hottest and driest air circulating around the anticyclone will stay a bit to the east of here today. Of course, as everyone has been mentioning, the lack of any upper-air data from northern Mexico for the past 8 days makes for much uncertainty. This is complicated by the NAM forecast which indicates a distinct S/W at 500 and 700 mb moving across southeastern Arizona this evening. In the model, this feature yields a good shear profile as 500 and 700 mb winds become east-southeasterly. Thus, an increase in coverage and intensity of storms is possible this evening – assuming the model has a fair degree of accuracy over northern Mexico. We are heading to the grasslands near Sonoita this afternoon and tomorrow, and I’ll report back on Sunday on the storm activity we observe down there in the hinterlands. Yesterday I said that I’d be surprised if any ALERT stations in the Pima County network caught rain. Well, I was certainly surprised and quite amazed that an apparently (to me – Pat Holbrook had warned on Tuesday that Wednesday might be a big day) hostile environment produced a round of severe storms and heavy rains. I shot a photo of storms approaching the house (taken about 5:45 pm on the 8th) from the south – see above – and we had 0.39” here at house. Airport got double that; 60 of 93 ALERT gauges caught rain; The Mt. Hopkins RAWS site recorded 2.60” and the Alert gauge on far south Wilmot had 2.13”; a number of warnings and alerts were issued by NWS; and severe storms were reported near Green Valley (wind) and San Manuel (wind and ¾” hail). So, it was not exactly a quiet day. While the precipitable water was trending down in the morning, it stabilized and held through the afternoon, while Phoenix actually increased some. So, the northwest winds coming off the low desert were not bringing in drier air, as I’d expected. The big storms that developed on and around the Rincons generated strong outflows that moved to the north (downhill). The resulting convergence zone over the metro area produced the storms that moved across much of the city. Doing a quick postmortem, I see that I had not accounted for the rapid shift eastward of the 500 mb anticyclone - from near Yuma on Tuesday evening; to northeast of Tucson yesterday morning; to south central New Mexico yesterday evening; to northwest corner Texas Panhandle this morning. So, it was a rapidly changing large-scale environment, which favors storms as opposed to a stagnant anticyclone. Pat H. or Erik P. had mentioned this fact, but it eluded me yesterday. The shifting high acted to shunt terribly hot 500 mb air northward and the shifting flow overhead appeared to bring in some slightly cooler 500 mb air from the vast data voids of northern Mexico. So, conditions here in southeast Arizona fought off the deep dry air that impacted much of the west and north parts of state yesterday. This morning the PW is definitely trending down, surface flow from the south to southeast appears to be bringing in drier air. The NAM keeps some convection in southeast Arizona today and then shuts it down tomorrow, as very dry air in the upper-troposphere swings around the bottom of the upper anticyclone. Me, I’ll just watch today and see if my Tuesday outlook verifies two or three days late. Yesterday was a tough day for an old-time forecaster, as the WRF forecast totally out did my assessment that the hot and hostile air in upper half of troposphere would dominate the low-level moist surge. If anything, there was more storm activity here in the southeast corner of the state than the model predicted. One small tower went up right overhead and gave us 0.02” in a minute or two and then it was gone. A storm out west of the Tucson Mountains produced a gust to 59 mph at Ryan Field. Nogales got hit with a serious storm that gave them a gust to 48 mph and over an inch of rain in a short period. The NWS forecasts were quite good yesterday, especially the early am update based on the new sounding data. As for rain here in the extended metro area, the ALERT network shows spotty reports with the most concentrated measurable rain occurring in the south and southwest portion of the network. Nine of ninety three gauges had measurable precipitation before 6 pm and another 12 measured rain after 6 pm (21 of 93 with precip during past 24 hours). This morning conditions were deathly clear at sunrise, quite a contrast to yesterday. Even though there is still CAPE in the morning soundings, the middle to upper troposphere is even more hostile today. The surge ended late yesterday afternoon and GPS precipitable water is trending down across southern Arizona. The anticyclone at 500 mb has shifted eastward and is now centered a bit northeast of Tucson near the Arizona/New Mexico border. Temps at 500 mb are an ugly -3 to -4C. So, I’ll just recycle my discussion from yesterday and say that I expect storms today only over the higher terrain of the borderlands and far east. I’ll be very surprised if any of the gauges in the Pima County ALERT network catch any rain today. Sky at sunrise looked quite chaotic, much like it does on big storm days. Was a muggy 80F at 6am here at house. ACC all directions except northwest and even some low cloud based below the tops of the Catalinas and the Rincons. Amazing changes as the dry Pacific air aloft battles the influx of low-level moisture from the Gulf of California and from outflows from borderland storms. Significant Gulf of California surge began yesterday morning between 7 and 8 am and has continued ever since. It’s remained fairly deep extending up to 4 to 5 thousand feet as per the radar VADs. Tucson’s morning sounding is quite impressive below 525 mb and indicates precipitable water of 42.57 mm – as said above a remarkable change overnight. The GPS data indicate that the sounding is a bit too wet – about 3 to 5 mm. The WRF sounding Mike Leuthold sent out yesterday was very moist – BL mixing ratio of 12 g/kg and lifted parcel theta-w of 24C – both values are higher than has been observed yet this summer. The WRF certainly picked up on the changes, but still predicted only isolated convection mostly south and east. Temperatures above 525 mb are very warm and will be increasing a bit during the day. Phoenix sounding much drier than down here and that superheated air will again be trying to advect this way. The 500 mb anticyclone begins its eastward position shifting during the day and much of southern Arizona should be under the influence of subsidence in the upper troposphere. So the question is how this battle will play out during the day – will the nearby mountains trigger significant storms before the hot air aloft chokes everything down? Will the low desert BL air with no CAPE invade the local area? Tough questions – my guess would be that things get too hostile in the Tucson metro region and that storms will again be mostly east and south. I still would bet Mike Leuthold a beer that the WRF predicted afternoon sounding for Tucson will prove too moist and unstable when the afternoon sounding data come in. But would I bet a crisp Ben Franklin – no way! If anyone checked visible satellite loops yesterday over the eastern Pacific you know that Blanca has been spinning away very impressively for at least 24 hours. Guess it escaped official detection because of the Holiday weekend. Looks like it will track too far to west to initiate a surge up the Gulf of California. Latest IR image above (on blog). So we’ll continue to watch, after two very suppressed days here locally, for some feature to push the subtropical, low-level moisture back north. Looks mostly hot – the 0.77” we got here at house has been quickly sucked back into the atmosphere, and I’ll have to be watering the plants again this afternoon. The last couple of days there have been well developed sea breeze fronts in Sonora. Looking at these two pics looks like Organ Pipe had sea breeze induced thunderstorms today....what ya think? Too bad there aren't obs down there! The period of active storms and significant rains ended in the greater Tucson area about 3 am yesterday morning and the rest of the 4th was quite suppressed – at least wrt thunderstorms although there was a great fireworks display at one of the foothills resorts early last night. The stormy period began here Monday afternoon, so there were five straight days with storms somewhere in the greater metro area. Now the question is: how long before storms return to the local area? The morning Tucson and Phoenix soundings today indicate that there’s no CAPE available at low elevations and convection will probably be limited to higher elevations in the east and the borderlands. The Phoenix sounding indicates that drier low level air will be spreading southeastward from the deserts. The models continue to keep very light winds over southern Arizona in middle levels as the west to east extended ridge continues almost overhead. The anticyclone builds back over the Southwest after a couple of days but the models indicate a much drier atmosphere when this happens. As the desert heats ups, surface pressures will continue to fall (they’re down about 2-3 mb over the state in past 24 hours) which will be something to watch. The models also continue to indicate a tropical storm tracking southwest of Baja, so the exact path of this feature will be of interest. Regardless, the first full week of July will apparently be a lot less interesting, meteorologically, than was the spectacular end of June/start of July. A storm report from up north. The ring of fire set up late afternoon nicely on doppler radar. 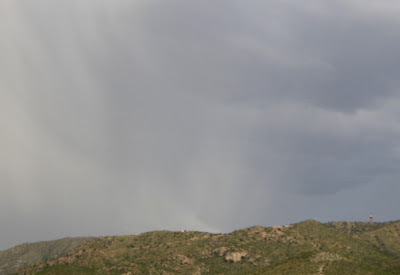 Gila County had repeated activity with heavy rainfall and pea size hail reported. Spotters also called in with wind gusts over 50 mph,downed fences and an isolated dust storm. At Sky Harbor Airport, the precip sensor is showing a minimum of 0.03 inches of precip from last night's activity and ponding remains scattered along the tarmack. Fireworks! Graphic from Art Douglas showing total lightning strikes from 26 June through yesterday morning at 1300Z on the 3rd of July. Quite amazing week. During the day yesterday there were some storms drifting around, mainly over higher terrain, with fairly limited coverage. However, storms developed in the southeastern Phoenix area late in the afternoon and produced several damaging winds. Flow in the lower troposphere was light but NW to N and organized outflow apparently got going and headed southeast in our direction. It had really cooked up during the afternoon at lower desert elevations – temps around 105F with dewpoints holding in the low 60s. After two early thunder events with no rain (around noon and again around 7 pm), thunderstorms rolled in about 9 pm with lots of lightning and thunder. No downpours here at house but an extended period of moderate rains that totaled up to 0.77”, the first rain this summer of any substance here at house (house is 32.27N 110.93W at about 2369 ft MSL – Tucson airport is at 2641 ft). While rainfall affected perhaps 20 to 30% of eastern Pima County during the day, all of the ALERT gauges recorded measurable rainfall after 7 pm, with many substantial amounts! For example, 33 of 93 sites recorded more than an inch of rain and there were four spots that measured more than two inches. Most of the rains fell between 8 pm to 3 am. So, quite a rainfall event! In this part of town, since it was the first serious rain, there are some spade foot toads out and about and lots of ants and termites swarming about this morning. The Rillito wash is running nicely and the air is fresh and clean – a great start to the fourth of July. Hope everyone has a great holiday. PS – Mike Leuthold hopefully was back from Minnesota to see this one. This morning’s TWC sounding indicates that considerable CAPe is again present. precipitable water remains near 40 mm, although drier air above 400 mb may inch its way across eastern pima County this afternoon – the upper-level dry line lies north to south across the county and has been fairly stationary this morning. The very thick cloud plume from Sonora has shifted eastward and covers only the southeast corner of Arizona but much of New Mexico. A distinct, but weak, shortwave is now positioned to the east of Tucson and winds below 500 mb are mostly from the north with very light speeds. Anvil level winds have become more westerly and this trend will continue according to models. Steering winds are weak and storms will go wherever their outflows and small-scale CAPE distributions take them. The NAM 500 mb initial analysis – see above - indicates a string of 500 mb vorticity maxima along the east coast of the GoC (looks a bit like 2-delta noise) – but with no soundings from Mexico this morning, it is unclear how accurate this initialization might be, since it is primarily driven by the previous NAM forecasts. Interestingly, the NAM predicts a consolidation of the features over eastern Arizona and the GoC into a single shortwave that moves back to the northwest, making the weekend quite wet and stormy – at least in the model’s world. As for today – definitely more sunshine to cook things up. Ample CAPE for storms that will drift about some given the lack of any clear steering flow. Heavy local rains possible in spots – a wet microburst or two also possible. Should be an interesting day and possibly weekend also. I’m going to guess that we have a 50-50 chance for rain here at house today since the weak northerly flow could let Catalina buildups drift our way. The above is 24 hour radar estimated rainfall from KEMX (the Tucson Doppler radar) sent by Art Douglas. While these radar estimates tend to be high, they indicate very well where the strong storms occurred yesterday afternoon. Eastern Pima County and the Tucson metro area had considerably less thunderstorm activity than during previous couple of days. 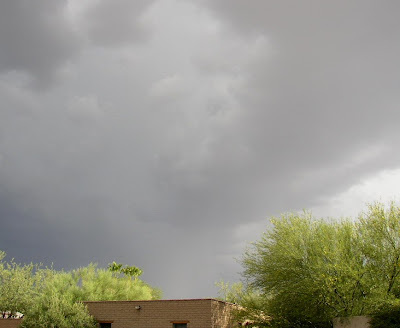 The strong storms over the Tucson mountains provided lots of rumbling thunder here at the house but only some spits of rain and another day with just a Trace. The strong storms that drifted north from the Catalina Mountains produced 1.41" of rain at the Oracle Ranger Station. Only 23% of the gauges in the Pima County Alert network reported measurable rain in past 24 hours, down from 70% on Tuesday and 46% on Wednesday. Five higher elevation stations did report over half an inch yesterday. I see that Sky Harbor airport in Phoenix had 0.01", so they're batting about the same as we are here at house. The radar estimate also indicates the large area of Sonora that had very strong storms and intense, very cold-topped clusters yesterday. Yesterday was not as active as Tuesday. There were lots of storms but steering level winds weakened during the day in southeast Arizona and anvil level winds became southerly. Thus, here at house the early storms down on the south side of metro area anviled us out and this was reinforced by more thick anvil clouds coming up from the borderlands. The visible image from 0100Z yesterday evening shows how widespread storms were across the Great Basin and Southwest, into California. The Pima County ALERT network had measurable rain at 46% of the gauges but amounts were much smaller than on Tuesday. Only 3 stations had ½ inch or more – with 1.93” at Arivaca being the only amount over an inch. Here at the house we had a Trace in some light anvil sprinkles at dark. I also see that storms avoided the Phoenix area once again. Today – once again heavy debris cloud and a few showers cover the central part of the state. There appears to be a bit more CAPE today with the lifted parcel having theta-w of 23 to 24C this afternoon (but the slopes in Sonora appear to have 26C which will produce very deep storms again today with very cold tops) – assuming some good sunshine. Skies are clear along the eastern portions of the state. Local heavy rains are main threat today. The shear profile remains quite bad with anvils streaming out in same direction storms will be trying to move. Don’t get rain here at house in this flow pattern unless something bubbles up almost right overhead. Also see the NAM precip forecast has another donut hole over the Phoenix area this evening. >they were propagating along and toward higher elevations where there was more CAPE available. Jack Hales and I noticed this once the gust front got into Old Mexico too: Storms would fire on the north slopes and peaks of the short little ranges S of the border, but not in the basins. It was as if the lift atop the outflow density current struck a convective match on every mountainside. I have lived here enough summers now to have watched in frustration many afternoons as storms that were heading right toward the house veered off along the flanks of the Catalinas or turned left (as on Tuesday) and ran down the flanks of the Rincons. A difference of just 1000 ft in elevation out here can affect CAPE enough to influence how and where storms propagate. Note - if someone wants to check to see just where this is, enter "Ash Canyon Arizona 85615" into Google maps. Obviously the summer rains came right in with summer down near Art's property! Heavy storms moved across the Tucson area for the second straight day yesterday. The radar loops show several pronounced outflows played roles in the detailed evolution of the storms. 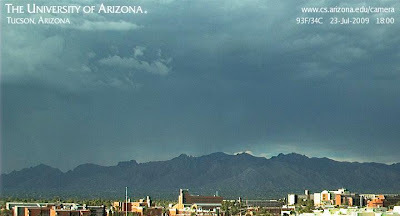 photo above shows a large thunderstorm moving across the east flanks of the Catalinas. This storm produced a strong outflow, again with lots of blowing dust. Winds at house were around 40 mph but there was only 0.03” of rain as the storm moved to the south and weakened over downtown. New and more intense cells formed to the west and south. Data from the Pima County ALERT network indicated that ~70% of the sites had measurable rainfall, with 4 stations reporting over an inch of rain. Brawley at three Points (west of downtown on the other side of the Tucson Mountains) reported 2.20 inches of rain and there was wind damage associated with this storm cell. Heavy clouds and continuing showers are between here and Phoenix this morning. The TWC sounding was modified by the deep clouds and is not representative of the larger-scale environment – making the forecast situation difficult. A special sounding at 18Z might prove very useful today. Regardless, precipitable water values are now very large – about 1.75 inches or 45 mm. The NAM predicts that a weak shortwave at 500 mb will be affecting south-central Arizona this evening and that vertical wind shear will again be favorable for strong storms. It appears that storms will occur over a larger portion of the south half of state and that the Phoenix area may be affected today. The details, of course, depend upon the evolution of the current messy cloud/shower situation and how much sunshine and heating occur this afternoon. But definitely another interesting weather day.